The book has been carefully researched—collecting documents from official military sources, interviewing former U.S. veterans of the war, and even using American soldiers’ letters to put together a picture of a less than glorious venture into Vietnam. There is no doubt that what American soldiers had done in Vietnam was in no small part due to the civil rights movement and the anti-war protests that equally affected them as it did to Americans back in the United States. What must also be remembered is that in a guerrilla war, the enemy uses no less dirty tactics to beat and demoralize the enemy. The Vietnamese Communist guerrillas and the North Vietnamese Army committed savage and brutal war crimes against the Vietnamese civilian population—a topic that cannot even now be mentioned in Vietnam today because the ruling Communist government will not allow it. There is no question that many American soldiers were conditioned by the things that the enemy did that made many of them snap and commit brutal crimes against the Vietnamese civilian populace. This is one of the reasons why America would ultimately lose the war in Vietnam, and why many Vietnamese civilians may forgive what American soldiers did but will not forget. The book is a litany of crimes and inhumanity that explains one of the reasons why the whole war went wrong for the United States, and why the Vietnam War, more than many wars past or the more current one in Afghanistan, remains extremely controversial. Of course, the just past Iraq War (2003-2011) and the present Afghanistan War (2001- ), may yet prove no less controversial. The number of books on these two wars are still coming out gradually, and may reveal things no less astounding. 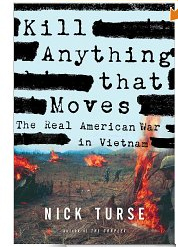 For all my readers, I recommend Kill Anything That Moves: The Real American War in Vietnam.